I read this article and found it very interesting, thought it might be something for you. The article is called Delhi 2015 Exit Polls: AAP Clearly Ahead and is located at https://archive.indiaspend.com/cover-story/delhi-2015-exit-polls-aap-clearly-ahead-87549. Exit polls conducted by various agencies after the Delhi assembly elections have one clear winner – Arvind Kejriwal-led Aam Aadmi Party (AAP). While the projections vary between 35 seats and 53 seats for AAP out of the 70 assembly seats, two polls have predicted a complete wipe out of Indian National Congress (INC) from the Delhi assembly. 2015 witnessed one of the fiercest political battles for the post of Delhi Chief Minister with the surprise entry of Kiran Bedi from the Bharatiya Janata Party (BJP) as a challenger to Arvind Kejriwal. In an earlier study, IndiaSpend had analysed all the assembly constituencies of Delhi and how each of the three parties performed in the 2014 Lok Sabha elections. The study done by Praveen Chakravarty, IndiaSpend’s founding trustee and an electoral data analyst, found that BJP had got the maximum votes in 60 assembly constituencies. 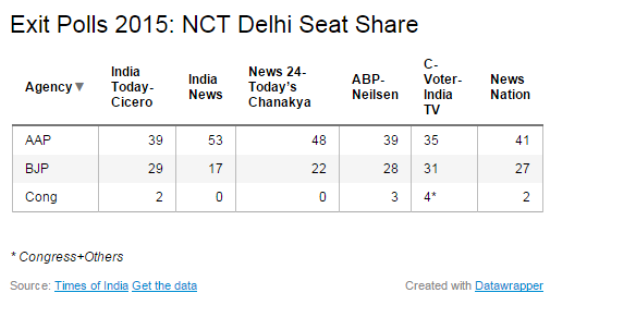 Assembly elections exit polls are obviously painting a different picture. Let us now look at how close the predictions were in 2013. As per a report in NDTV, which had calculated an aggregate of the various poll surveys, BJP was a clear winner. Here is the twist – BJP did get the maximum number of seats in 2013 but AAP managed to form the government with the support of Congress. The exit polls had not guessed the decline of Congress in the 2013 Delhi state assembly polls. And AAP was also underestimated. 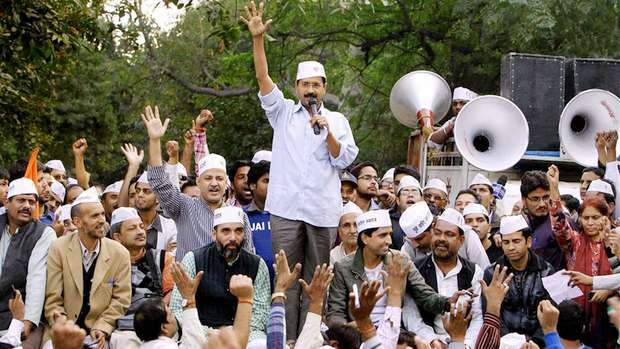 This election, however, is a close tussle between BJP and AAP. BJP’s trump card was the CM candidature of Kiran Bedi. While AAP got all the success from the Anna Hazare movement against corruption, BJP managed to get one of the leaders (Bedi) from the movement. So, will BJP actually benefit from Bedi’s entry? We will know the final outcome on Feburary 10th.